An instruction manual in two volumes based on the use of peroxide in mushroom cultivation. An entirely new approach to personal mushroom growing and non-Sterile Mushroom Cultivation. species of fungi that are both beautiful and delicious, and learning to cultivate them can revive our connection to nature and the earth. But if we have to buy a lot of equipment to sterilize substrate and clean the air of contaminants, growing mushrooms can lose its romance. And it can get absurdly complicated when cultures keep spoiling, despite our most elaborate precautions. 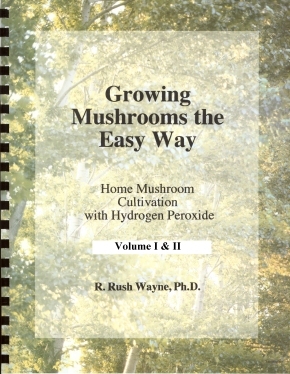 Volume I of Growing Mushrooms the Easy Way is both an indispensable introduction to the use of hydrogen peroxide in mushroom culture and a general primer on basic mushroom growing. It describes techniques for preparing mushroom cultures without air filtration or sterile facilities, and without autoclaves or pressure cooking of bulk substrate. # preparing "Ten Minute" grain spawn with "instant rice."